Eduard Amvrosevich Shevardnadze rose to prominence as the foreign minister of the U.S.S.R. under Mikhail Gorbachev. After the breakup of the Soviet Union he was elected President of his native Georgia. At the end of the September 1990 mini-summit conference in Helsinki, while Presidents Bush and Gorbachev were giving their television press conference, the cameras also focused on the front row of VIPs—Barbara Bush, Raisa Gorbachev, James Baker (the American secretary of state), and Eduard Shevardnadze (the Soviet foreign minister). As with each of the annual summits between the United States and the Soviet Union after 1985, somewhere in every picture, standing near Gorbachev, was Eduard Shevardnadze. Thus, it was a shock not only to the Soviet president but throughout the U.S.S.R. and abroad when Shevardnadze suddenly resigned December 20, 1990. He left with an ambiguous warning of an impending dictatorship. In his post of foreign minister, Shevardnadze had become one of the most easily recognized Soviet leaders abroad. While Gorbachev was the chief architect of the Soviet foreign policy called novoe myshlenie (new thinking), his chief disciple was Shevardnadze. He was always present at international gatherings, having prepared the way, yet appropriately retreating to the background and surrendering center stage to Mikhail Gorbachev when high-level meetings actually took place. 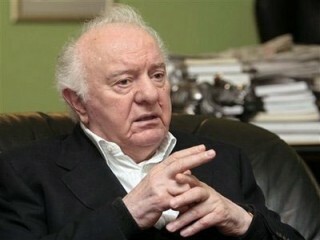 A Georgian by nationality, Eduard Shevardnadze was born in a small town, Mamati, near the Black Sea on January 25, 1928. At 18 he was a Komsomol instructor and at 20 joined the Communist Party of the Soviet Union (CPSU). His formal education included the Higher Party School of the Communist Party of Georgia, from which he graduated in 1951, and a teaching degree, by correspondence, from the Kutaisi State Pedagogical Institute (1960). He married a journalist and was believed to have children. In the 1950s he principally worked for the Komsomol, rising to the position of first secretary of the Komsomol of Georgia (1957-1961). He was also a member of the Central Committee of the All-Union (national) Komsomol. From 1958 to 1964 Shevardnadze was a member of the Central Committee of the Communist Party of Georgia. In the 1960s he worked within the Communist Party of Georgia for several years at the raikom (district) level and then for the Georgian Ministry of Internal Affairs (MVD), the civilian police, where he served for seven years as minister of internal affairs (1965-1972). In 1972 Shevardnadze was appointed first secretary of the Communist Party of Georgia. In this position he built up a reputation as the man who cleaned up, at least temporarily, corruption in the Georgian Republic. It is believed that his life was threatened on several occasions because of his efforts to eliminate corruption. His work as first secretary of the Communist Party of the Georgian Republic for 13 years attracted the attention of the national party. In 1976 he was elected to the Central Committee of the CPSU and in 1978 was made a candidate member of the Politburo. This was the same year that Gorbachev was brought to Moscow to serve as Central Committee secretary for agriculture, and one can assume that their close association began at least by 1978. In 1985 Gorbachev appointed Shevardnadze to be his foreign minister, replacing the long-term (28 years) foreign minister, Gromyko. Shevardnadze also became a full member of the Politburo, the first Georgian since Stalin to serve on the highest organ of the party. In the next five years Shevardnadze made his mark in foreign policy, and virtually everyone forgot that he had little prior experience in external affairs. He soon gained respect and admiration for his keen intelligence and ability to deal rationally with international problems. Shevardnadze was constantly on the road after his appointment, visiting the United States numerous times, Great Britain, China, France, Japan, Germany, and many other countries. In superpower politics, foreign minister was probably the most exhausting position apart from the presidency. Shevardnadze built up a good rapport with his American counterparts, Secretaries of State George Shultz (1985-1988) and James Baker (1989-1990). Shevardnadze had spoken out strongly at the 28th party congress against the conservative criticism of Gorbachev's administration, which was led by Yegor Ligachev. Unlike some occasions when he did little but report on foreign policy, Shevardnadze actively responded to the charges against new thinking and Soviet foreign policy. But he was a troubled man. Six months later he suddenly resigned as foreign secretary, December 20. A little more than six months after that he quit the Communist Party. Meanwhile he became head of the new Movement for Democratic Reform, built around such liberals as former Presidential Council member Alexander Yakovlev, sometimes called the father of perestroika; industrial specialist Arkady Volsky; legislator Ivan Laptyev; mayor of Moscow Gavril Popov; and St. Petersburg (Leningrad) mayor Anatoli Sobchak. To replace Shevardnadze, Gorbachev appointed career diplomats Alexander Bessmertmykh and then Boris Pankin. Gorbachev wanted to bolster his flagging prestige and persuaded Shevardnadze to return to his old foreign ministry post on November 19, 1991. However, the breakup of the Soviet Union the next month brought an end to the Cold War. The U.S. recognized the independence of Georgia on December 25, 1991 and provided aid for food, fuel and medicine. The popularly elected Georgia president, Zviad Gamsakhurdia, was overthrown by opponents of his increasingly dictatorial regime and replaced with a military council. In March 1992 Shevardnadze returned to Georgia to head a four-person State Council, which replaced the military council. On October 11, 1992 voters elected a new parliament, with Shevardnadze as chairman. By September 14, 1993 the political and economic situation in Georgia had so deteriorated that Shevardnadze resigned to protest the parliament's blocking of his ministerial appointees. At the request of the parliament, he returned to office two days later. Turmoil and conflict continued in Georgia with minorities and separatists fighting for control of power and resources. Shevardnadze continued to guide the country, challenging Western nations "to rise above national interests and establish a post-Cold War order." During a visit to the U.S. in 1994, President Bill Clinton described Shevardnadze as "a statesman whose vision and diplomacy have played an immeasurably important role in bringing a peaceful end to the Cold War." In 1995 Shevardnadze survived an assassination attempt and the same year was elected Georgia President in a popular election. He continued to guide the Georgia state through the uncertainty of the post-Cold War period. View the full website biography of Eduard Shevardnadze.